The Naval Facilities Engineering Command (NAVFAC) forecasts show that aging infrastructure of several Northeast military facilities is in critical need of rehabilitation. Based on a track record of success supporting contractors on NAVFAC projects, Terracon was the go-to firm for quality control and engineering support for the repairs of piers, dry docks, and seawall waterfront improvements at Naval Station Newport and Portsmouth Naval Shipyard. Terracon mastered the rigorous submittal testing required to meet the Navy’s very stringent marine concrete specification, and performed thermal modeling mock-ups and temperature computer models for mass concrete placements to minimize thermal stresses in the fresh concrete. The importance of these services is to ensure the long-term durability of the concrete in the harsh marine environment. Salt and chloride attack and degrade the concrete and allow for steel corrosion. The concrete must not only meet strength requirements, but shrinkage and chloride ion permeability requirements. Terracon has a proven track record of providing these testing services in a prompt and cost-effective manner for NAVFAC projects. Of all the work Terracon performed for NAVFAC, Dry Dock 1 was of particular interest due to the historically sensitive nature of the facility. Dry Dock 1 was designed in the 1800s by prominent civil engineer Loammi Baldwin, Jr. as part of the Boston Naval Shipyard (formerly known as Charlestown Navy Yard) and inaugurated in 1833 as the first naval dry dock in New England. From 1814 to 1955, 133 naval war vessels were constructed at the Boston Naval Shipyard. Between those years, naval ship construction changed from wood-hulled 90-gun “ships of the line” to side-wheel steam gunboats to Korean War–era steel-hulled destroyers and escorts. 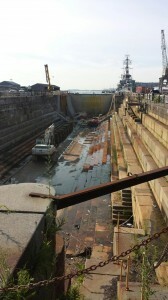 The dry dock’s last commissioned use was in 1975 and it is now part of the U.S. National Park Service. It is still used for the periodic maintenance of the USS Constitution and other park-owned vessels. While the National Park Service owns the dry dock and the surrounding property, NAVFAC provides maintenance and repaired and preserved the facility to function as a “working landmark.” Terracon was brought on board to assist with NAVFAC’s rigorous quality control and concrete testing requirements by providing forensic concrete testing on the inner seat of historic Dry Dock 1. The repair work consisted of partial demolition of the concrete sill and inner seat through a combination of mechanical and hydro-demolition of the concrete. This combination was used for efficient removal of the older concrete while not “bruising” the underlying concrete, which may result in reduced durability through micro-fractures within the underlying concrete structure. After cleaning the surfaces, an 8- to 1-inch-thick reinforced marine concrete layer was placed over the structure. Terracon provided a team of concrete technicians for the field and plant materials testing services. While the total volume of concrete repairs was relatively small (less than 600 total cubic yards of concrete), the quality requirements for mixing and placing the marine concrete were extremely stringent. The marine concrete needed to meet NAVFAC requirements for chloride ion permeability, alkali-silica reactivity, and dry shrinkage to provide the durability required for the harsh marine environment. Three technicians were required for every placement and each truck of concrete was tested at both the pump and discharge for air, slump, and temperature properties. Each placement had sets of test specimens made just for chloride ion permeability testing to determine the concrete’s transport properties. Through Terracon’s advanced materials testing resources, our electronic reporting and tracking platform (CMELMS), and rigorous use of certified inspection personnel, this historic restoration project met the programmatic milestones and provided a long-term solution which helped preserve one of our nation’s most precious emblems, The USS Constitution.